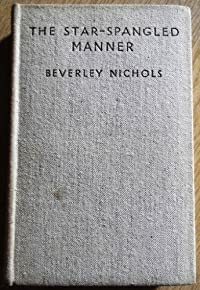 The Star-Spangled Manner by Beverley Nichols was first published in 1928 and it’s a collection of twenty-three essays about various aspects of life in America in those days. More than anything I was struck by how topical many of the subjects are, even after ninety years. Beverley Nichols obviously liked visiting America, he lectured there and supervised the production of plays. He had lots of friends and very high-profile contacts there, but he was always an observer and often a critic. He even managed to have a meeting with the then President, Coolidge who apparently had a reputation for being rather silent and lacking in personality, but Nichols managed to get some interesting thoughts and anecdotes out of him. Prohibition was in place at this time, so there are his observations on that – it’s a mess of course. He also meets a Trump-ish businessman with his eyes on the White House, but it’s towards the end of the book that his thoughts turn back to Britain and the need to regenerate British industry. He calls for Europe to unite and to get rid of all the economic tariffs between the various European countries. From the previous books that I’ve read by Beverley Nichols I had no idea that he had a serious and deeply thoughtful side to his personality. He’s not perfect of course – who is? But I really like being in his company – via his books. How Brexit would have enraged him!